Pictures of Coves End My Wish at SeaRidge "Sprite"
Pictures of Keeva Bay's Fifty Shades "Christian"
Puppies expected in April 2019!! Please fill out our puppy questionnaire if you would like to be considered for a puppy from our April litter, or call 919-649-4898. You can see pictures of our 2016 litter on our SeaRidge Face Book page. 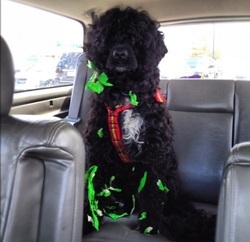 The Portuguese Water Dog is a highly intelligent, energetic, working breed. It is not a breed for everyone. They require lots of exercise, mental stimulation and time with their loved ones. When left alone they can create entertainment for themselves which may or may not be to your liking. They have an incredible sense of humor and are often creative, manipulative, demanding and very mischievous. They know what they want and will try several ways to charm you into it. They have a non-shedding, hypoallergenic coat. The coat comes in two styles; curly and wavy. The curly coat is very similar to a poodle. The wavy coat has more of a sheen, falls in loose curls or in some dogs appears almost straight. There can be quite a bit of variability in the amount of curl from one wavy to the next. It is very common to have a litter with both curly and wavy puppies. Portuguese Water Dogs come in Black or Brown with or without varying amounts of white. They need frequent combing or brushing and since it is hair instead of fur, it continues to grow. You will need to find a groomer who can cut their hair every couple months or learn to do it yourself. If they aren't groomed regularly the hair will mat and it can become very painful for the dog. This is Sadie, she was left for a very short time alone in the car. She found my green duck tape and decided to decorate herself.